I have something exciting to share and introduce you to. We live in a world today where we have to be aware of everything around us. The food we eat, the air we breathe and the water we drink. Now there is another danger lurking that is finally being exposed, Electromagnetic Fields (EMF's). They are everywhere and the big push for G5 is mounting. G5 already exists in all new appliances. Studies are proving radiation from cell phones, WiFi and Gwen towers are extremely harmful to humans and animals alike. This is pretty much common knowledge now and people have fought against these things with not much success. Belgium just banned all G5 in their country as Russia did earlier. Hopefully, this will start a new trend worldwide. The good news is there are ways we can now protect ourselves and our living spaces/environments from these dangerous frequencies, not by blocking anything but by transforming the negative frequency to a positive one that is beneficial. This ancient Egyptian pyramid technology was first re-discovered and introduced by Nicola Tesla in the early 1900's. Enter Slim Spurling…. In 1991 while attending Colorado State University, off and on for 8 years, he focused on the Forestry Curriculum, which included all the natural sciences as well as chemistry and biochemistry. He became a "master dowser" and blacksmith entering into the world of metal alchemy. He started tinkering in his studio with polarities and copper wire. He discovered that if he doubled the wire, twisted it in a certain direction, formed a ring and soldered it together to exact "cubit" measurements, something magical happened. In the space inside the circle, a "tensor" field (or frequency) was created where rapid healing can occur as well as balancing the energies of the environment around us. Slim used this frequency to transform negative energy on the planet. He could direct stormy weather, and he quietly cleaned up the air in Denver taking it OFF the top 10 list of cities in the US with the highest concentrations of smog. Although Slim is gone now, I was lucky to find this old interview done with him where he explains his journey of discovery and what it's all about. What better than to hear it from the "master" himself. What's this all about? Want more info? Tensor Technology is noted for its use in healing, energizing and restructuring water, enhancing plant growth and vitality, and beekeeping among thousands of other observations. It is truly an integration of Scientific and Spiritual Technologies. As mentioned earlier, Slim Spurling re-discovered Tensor Ring technology in 1991. He knew of John Wheeler's extensive work with closed loops. John Archibald Wheeler, who coined the term "black hole", came up with the mathematical theory of the "Tensor Field", which is found inside the ring. Hans Becker, an astrophysicist, who extensively tested the Spurling Rings, found the ring to oscillate at 144Mhz, a harmonic of the speed of light. He said that "When you create a closed loop coil, energy begins to flow and the laws of physics go out the window. They may be the simplest, most efficient source of energy there is…gathering it and condensing it freely from space." Tensor fields create an anti-gravity field. Grebennikov's work supports this hypothesis as well as Mueller's global scaling, where Tensor Rings emit a harmonic to a specific gravitational wave. He also demonstrated cancellation of electromagnetic fields within a Ring through GVD photo imaging. Tensor Fields restructure electro-magnetics to where they are beneficial to the human body. A recent bio-feedback study with the Cell Phone Tab shows that using a smart phone with the Cell Tab affixed to the phone case, not only protects you but also aligns the Chakras and energy bodies as well. According to Phillip Callahan, an expert on Paramagnetism, Tensor Rings exhibit a Paramagnetic value many times greater than anything ever tested. This means that Tensor Rings cause some of the elements in water to spin to their high-spin state referred to as ORME [Orbitally-Rearranged Monoatomic Elements]. This has a tremendous impact on water's molecular structure and on the energetic components of the water. The authors of the book "Dancing with Water" discuss the molecular structure of water and the resulting coherence in using a Tensor Ring. "When water is passed through a Ring, its molecular structure becomes more organized. The longer it sits inside the column, the more refined the structure becomes." I have some of these tools on my table at the BCP Market every Tuesday for you to look at and answer your questions. For example, the simple 2" WiFi ring can be placed on your modem, worn as a pendant or placed in your pocket or purse. It protects you from harmful frequencies wherever you go. Check out the cell phone tabs, pendants, and Tensor Rings in different sizes. The Coils create a toroidal field surrounding the body and the disc, that sticks to your source of electricity, i.e. the fuse box, will transform the frequencies that enter your house or structure. My favorite are the Spheres that generate a frequency out in all directions, protecting your house and property and everything in its field (my plants on the farm love it). My catalogue of tools, descriptions and prices are available upon request or I have copies at the Market every Tuesday. The above message was distributed by News Boquete, a free subscription-based community service. News Boquete's ONLY public email address is news.boquete@gmail.com. For more info and use policy, visit https://www.dropbox.com/s/24y1vz2vae9iaen/News_Boquete_Policy.pdf?dl=0. If replying to this message, reply ONLY to the ORIGINATOR (typically your email application's 'Reply To' function works). To stop receiving these emails, send a message to news.boquete@gmail.com with the word unsubscribe in the subject line or body of the message. © 2005-2019, News Boquete. All rights reserved. Public redistribution strictly prohibited without prior written permission. Tuesday, April 23 – Medical Insurance - Magda Crespo presents All About Insurance! How to use our medical plans in Panama, and the differences in how insurance works here. She will speak about the plans she has available, deductibles, co-payments, etc.. She will also address the "gringo prices" and how to avoid them. Tuesday, May 21 – The Primates Project at UNACHI was born in middle 2016 inside an initiative of environment conservation and monitoring of the Primates population in lowlands of the Chiriqui province. The project reunites investigators and students from UNACHI with the public in general. This project has developed some activities in different districts and areas in the province; but its main objectives are orientated to the study and conservation of the primates, though talks, monitoring studies, internships, education campaigns and workshops in Chiriqui. Dr. Ariel Rodríguez-Vargas, Biologist, specialist in conservation and environmental studies, works as a researcher in the Universidad Autonoma de Chiriqui (UNACHI) and is the primate project director. Dra. Laura Patiño Canom chemistry specialist in natural products, works as a researcher in the Universidad Autonoma de Chiriqui (UNACHI) and is the primate project group coordinator. "It's a Matter of Heart"
With a Master's Degree as a Cardiovascular Clinical Nurse Specialist, Charlotte worked in Critical Care & as a Critical Care educator for over 25 years. After going back to school to be a Nurse Practitioner (at age 50) she worked for a Cardiovascular Physician group in Orlando, Florida. 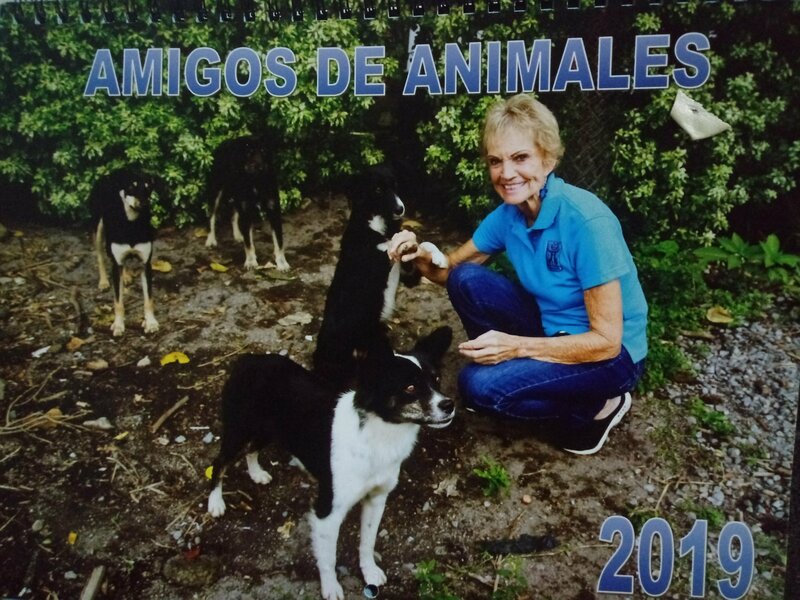 She then moved to Gainesville, Florida, and was a Geriatric Nurse Practitioner for WWII Veterans until "retiring" in Boquete to volunteer for Boquete Health & Hospice and....rescue dogs. If you have any skinny, starving, injured dogs or puppies, Please DON'T bring any more to her house! 5 are enough! Tuesday, June 11 – What is grief? How do we handle it? Donna O'Brien, former grief counselor, will present a brief discussion of Grief, how we experience it, and when it becomes a problem for us. 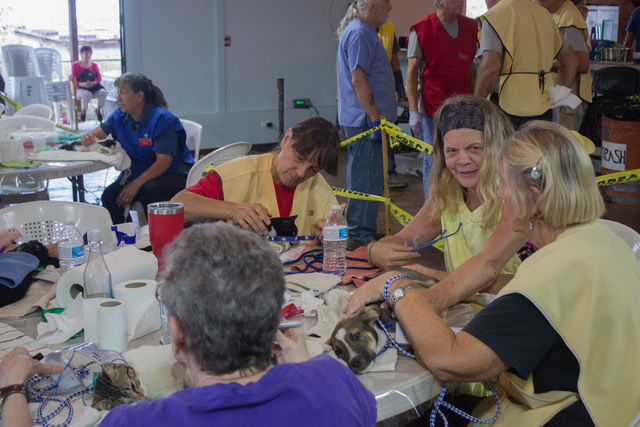 On Sunday March 31, 2019, Amigos de Animales spayed or neutered 259 animals, 135 dogs and 124 cats with five vets working: Drs. Aaron, Virgilio, Amanda, Ingrid, and Ricardo, along with Dras. Sandy and Chely. We were planning for "only" about 200 animals so the larger number was not what we expected, but everyone rose to the occasion. It was a longer day than our usual of late but the vets kept going and the volunteers stayed to see us through, which we greatly appreciate. There was a kitty crush at the beginning and we did not quite have enough volunteers, so the kitty workers doubled up and worked through it. It is hard to know what the right number of volunteers will be at any given clinic; sometimes we are slow, sometimes so fast we can't all keep up, sometimes more big dogs, sometimes more cats – flexibility and good attitudes keep us going no matter what! My personal favorite moment of the day was with a cat named "Mono Amarillo", yellow monkey. His owner was very proud of him, a big older yellow cat that had obviously been around a long time and had many fights under his belt. His owner called him a boxer, a fighter, and his love for this cat was obvious to all of us at the table. It is encounters like this that make our clinics so special to everyone involved. 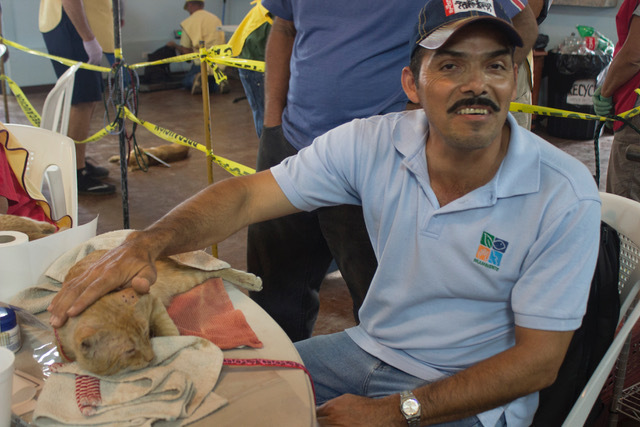 There is always a moment in the day that a certain dog or cat touches your heart and makes you happy to be there and meet the lovely local Panamanians who go through so much to make life better for their beloved pets. We met a sweet young girl who was so happy about her obviously well cared for cats…and she said she had 10 more at home! 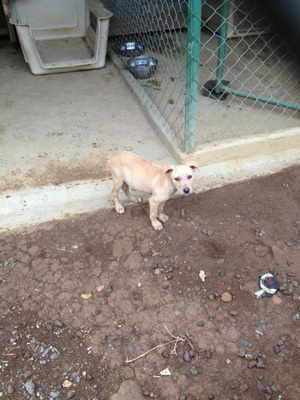 Lynn Bourbeau bonded with a sad skinny dog that had been brought in by Carmencita. Through all her pain and obvious misery, she wagged her tail and let us know she appreciated the care he was getting from Lynn. Hanny and Gijs took her and they report that she is thriving after being given lots of love and good food. They say an army runs on its stomach and that is exactly how it is with Animales. 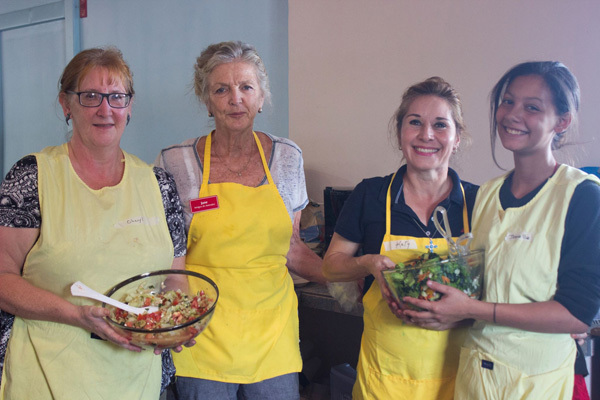 Thanks to our generous volunteers, we always have great food for breakfast, lunch, and snacks and thanks to Jane Hampton and her crew, it is always prepared and presented wonderfully. Many thanks to all who contribute to our kitchen! We welcome all donations – and anything chocolate would be really appreciated for those late afternoon lulls. A special thanks to Cynthia Dunne whose photos of the clinics and the volunteers generate great interest on Facebook. Be sure to check us out and like us and share. Our Casino Night party was a great success! 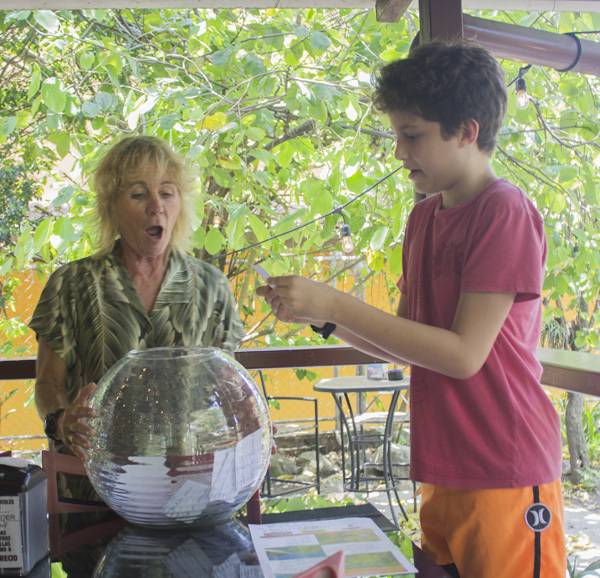 Lots of fun was had by all those who came and everyone was happy with the prizes they bid on and won. 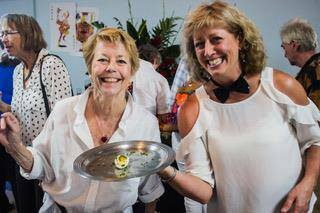 Kathleen Frederick and Debe Emerson and their team made sure that everyone had great food which was beautifully presented. We made $5688.07 which will be split evenly between Buenos Vecinos and Animales. Thank you to all who donated and participated and attended. 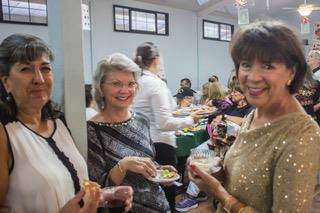 This was a very successful event in which we sold 133 tickets and raised over $16,000 thanks to our ticket buyers and sponsors and some very special "angel" donors. All the participants understand the impact our service has had on the community and were willing to part with $100 for a chance to win one of our fabulous prizes. We salute and deeply thank these wonderful donors and their commitment to our mission. Find the video of the drawing here . The next clinic will be Sunday April 28. 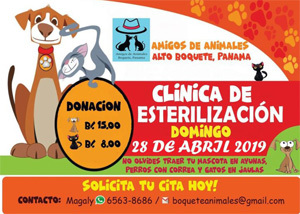 For a reservation, contact Magaly at 6563-8686 by phone or whatsapp, or email at boqueteanimales@gmail.com. To volunteer, contact Alicia at akcleavenger@hotmail.com. NOTE: we need towels of all sizes but especially smaller ones like face towels and washcloths. We always lose towels at our clinics as many animals go home wrapped up in the towels they were recovered in. Thank you! 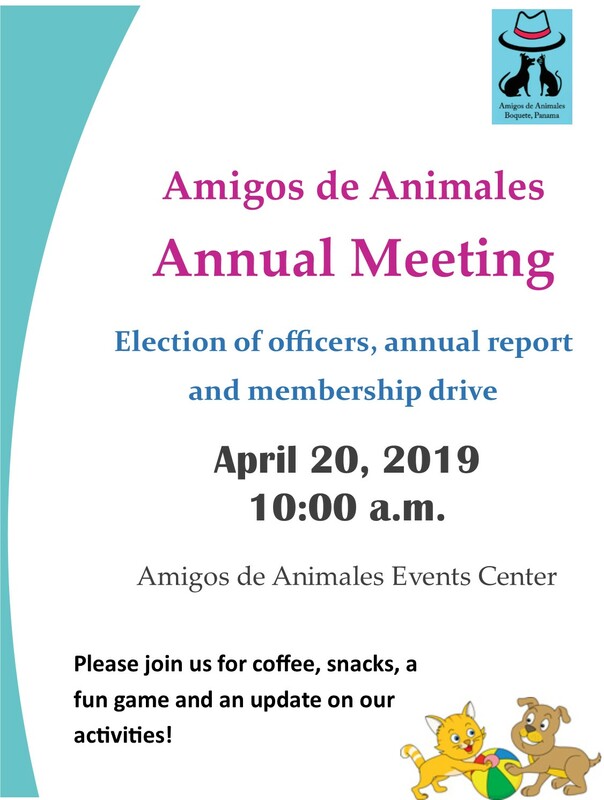 The Amigos de Animales Annual Meeting with be this Saturday April 20 at 10am at Animales. We will discuss the accomplishments of 2018 as well as our plans end events for 2019 and elect officers for 2019. Coffee and treats will be served and there will be some fun and games after business is completed. This will also serve as the kick off for our Membership Drive. Only $15 helps keep our clinics going – and you get a discount at some local stores as well. Please plan on attending, show your support for Animales - we hope to see you there! We will be taking reservations for the calendar 2020 at the meeting on Saturday. Let your pet be a calendar page star! 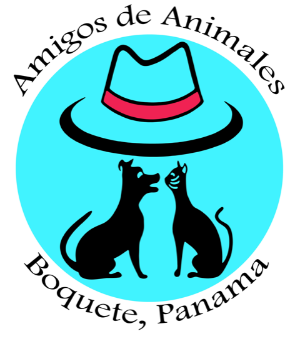 Copyright © 2019 Amigos de Animales, All rights reserved. [News Boquete] Don't Miss Your Chance! [News Boquete] Pilates Workshop "Vision Alive"
(c) by MGG Caddy S.A.. Simple theme. Powered by Blogger.